Home » Family & Kids Nutrition » 10 Ways to Enjoy Ancient Grains and Seeds! One cup of uncooked millet has as much fiber as 4 cups of white rice! Just one ounce of chia has as much fiber as 6 carrots. One tablespoon of flax has as much fiber as 4 cups of spinach. A half a cup of steel-cut oats has as much fiber as 4 cups of cornflakes. Choose a variety of ancient grains to maximize the diversity of plant power benefits. Flax is high in alpha linolenic acid a type of omega-3 fatty acid,and contains phytochemicals called lignans (80% more than other plants), and fiber. It is a food that fights cancer! They are also good for digestive health and can help lower LDL (bad) cholesterol, which can reduce risk of heart disease. Remember when adding high fiber foods to your diet, add them gradually and make sure you drink your water! For maximum nutritional benefit, grind the seeds before you eat them. Chia is a good source of calcium, magnesium, and phosphorus; these minerals are all important for strong healthy bones. It is also high in protein and fiber. When mixed with liquids, chia expands in the stomach and promotes that feeling of fullness –helping to signal your brain you’re full. This feeling of satiety can curb desires to overeat and promote weight loss. Buckwheat contains phenols, which protect your heart. Despite the mention of “wheat” in its name, it is gluten-free and there are many ways to enjoy it! Read here: how to eat buckwheat! Quinoa has anti-inflammatory properties and it provides a much needed dose of healthy fats, protein, phosphorus, manganese, copper, and magnesium. It also contains many antioxidants that contribute to overall health. Quinoa also contains a lot of fiber; in fact,1 cup of quinoa contains as much fiber as 8 cups of white rice! Amaranth, a seed used as a grain, provides calcium, magnesium, potassium, and iron. Like quinoa, it’s also a complete protein! Again, with 13 grams per cup, it is a great way to get your fiber in for the day. Adding amaranth to your diet may help reduce both LDL (bad) cholesterol and triglycerides, lowering your risk for heart disease. 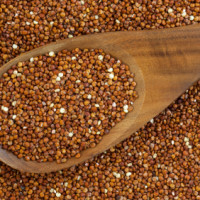 Millet provides polyphenols and dietary fiber. Polyphenols have numerous health benefits in cancer prevention and heart disease as well as antibacterial properties. Millet also contains magnesium, which may help reduce the incidence of migraine headaches, potentially improve asthma, and may improve mood during PMS. Oats contain beta-glucans, a type of soluble fiber. Beta-glucans play a role in reducing the risk of insulin resistance, dyslipidemia, hypertension, and obesity. Soluble fibers slow down digestion to help you maintain a feeling of fullness as well as positively affect blood sugar levels. Oats are also naturally lower in carbohydrates than other grains. Ancient grains can be used in any dish where you would usually use rice or oats. Some ideas include toppings for salads, additions to baked goods, or as a side dish. Sprinkle chia or crushed flax seeds into yogurt or cereal to add a powerful punch of protein and fiber. Chia can be soaked overnight in milk and cinnamon to create a yummy pudding. Or try sprinkling chia seeds onto a toasted whole grain English muffin and top with nut butter for a surprising crunch. Try using more gluten-free oats in your baking. I have a love affair with oats –they’re greatly underutilized. Making your oats into flour literally takes a minute and the result is a light and fluffy baked good! I put them in everything even my pancakes!! Steel-cut oats can be prepared ahead and reheated for a quick breakfast. If cooking them in the morning isn’t realistic, try putting them in the slow cooker overnight for a fresh warm breakfast! Try Udi’s steel cut oats with chia mixed with a tablespoon of almond butter. Before adding boiling hot water to your oatmeal, put 1-2 teaspoons of chia seeds in the hot water first and let them soak while making your tea or coffee. Then add in the oats. Try these tasty ways to introduce quinoa: easy quinoa grain salad, or black bean, corn and quinoa salad – which are great for school lunch, and quinoa pasta. Another simple and delicious quinoa recipe is vegetable cranberry quinoa garnished with Parmesan cheese. Cook 2 cups of quinoa with 4 cups of water or low sodium vegetable broth. Add ½-1 cup dried cranberries and 1 cup sliced raw zucchini. Add 1 cup raw chopped kale 5-7 minutes before the quinoa is finished. Two minutes before the quinoa is done, sprinkle the top with shredded Parmesan cheese until it melts. Once it’s ready, serve and enjoy with gratitude! Quinoa makes a great substitute for rice in fried rice dishes. Don’t forget it comes in many colors! So try them all. Try amaranth instead of rice in your rice pilaf recipe or replace the rice in your casserole with millet for a heart healthy alternative. Try replacing 1/3 of the white flour or whole-wheat pastry flour in your favorite cake or cookie recipe with amaranth flour. Amaranth and Quinoa have the highest protein value. Combine them with beans, fish, dairy, chicken, or cheese– for a real protein boost. Substitute half of your flour with flax meal when breading your chicken –this will also cut the sodium in half! Mix in lots of fruits and vegetables to create different hot and cold grain dishes. This lowers calories and carbohydrates while adding tons of nutrients! Try putting different spices in a salt shaker and letting your family add their own flavors to ancient grain dishes! We keep a variety of herbs and spice blends on the kitchen table and reach for these before the salt shaker! Try crumbling some of Udi’s ancient grain crisps into a large veggie and bean salad or enjoy with homemade guacamole. Learn more about ancient grain goodness! Comment on 10 Ways to Enjoy Ancient Grains and Seeds!